Something like 140-character tweets, a great exercise for students and teachers is to write using only six words. 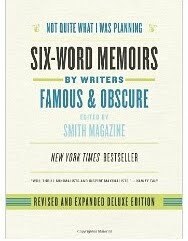 The NPR article and podcast "Six-Word Memoirs: Life Stories Distilled" are a great intro to writing 6-word memoirs. It all began with the book Not Quite What I Was Planning: Six-Word Memoirs. Give it a try; In six words describe your education. I originally wrote about this idea on May 1, 2008.